"The Devil of Hell's Kitchen" and a teenage witch headline this week's crop of streaming trailers. Netflix and Hulu have released new previews and info for several of their upcoming programs and films. Malevolent (Netflix, October 5) - Brother and sister team Angela (Florence Pugh) and Jackson (Ben Lloyd-Hughes) are nothing more than scam artists. Preying on the grief stricken and the vulnerable, they convince the bereaved that Angela has the ability to contact the dead. It's a simple con, until Mrs. Green (Celia Imrie) summons the pair to her home -- the orphanage that was once stage to a string of murders of young girls -- and Angela grows less and less certain of what's actually real. The fake paranormal investigators suffer the ultimate reality check when they are confronted by the true horrors and terrifying past that lie hidden within the haunted orphanage. Dancing Queen (Netflix, October 5) - A hilarious and heartfelt docu-series set in the dancing, prancing, world of the multi-talented, multi-layered Justin Johnson - aka Drag Superstar Alyssa Edwards - as he juggles his dance life, drag life, family life, and love life. Filmed in Justin’s hometown of Mesquite, Texas, Dancing Queen goes behind the makeup and into the drag performer’s highly competitive Beyond Belief Dance Company as he prepares a young class for an intensely competitive season. Salt, Fat, Acid, Heat (Netflix, October 11) - Master these four elements, master the kitchen. Based on Samin Nosrat’s best-selling book, Salt, Fat, Acid, Heat is the essential guide to the basic elements of good cooking. Across the four part experience, the spirited guide Samin travels to home kitchens of Italy, the southern islands of Japan, the heat of the Yucatán and back to Berkeley's Chez Panisse—where she started her culinary career—to demystify and explore the central principles of what makes food delicious and how each of us can easily incorporate those elements into every dish. Feminists: What Were They Thinking? (Netflix, October 12) - Netflix’s latest documentary takes a look into the women's movement of the 1970s through the collection of feminist portraits captured by photographer Cynthia MacAdams. 40 years later we look at the culture then and now. ReMastered: Who Shot the Sheriff? (Netflix, October 12) - Investigates high-profile events affecting some of the most legendary names in music, presenting groundbreaking discoveries and insights beyond what’s been previously reported. The first track of the ReMastered series investigates who is responsible for the shooting of legendary musician Bob Marley. The Boss Baby: Back in Business (Netflix, October 12) - Boss Baby, with the help of his big brother and partner-in-crime Tim, continues to navigate the cutthroat corporate jungle gym of Baby Corp., while angling to achieve the near-impossible: the work-life balance of a modern career baby. The Curious Creations of Christine McConnell (Netflix, October 12) - Wickedly talented baker and artist, Christine McConnell welcomes you into her terrifyingly delicious home to create delectable confections and hauntingly disturbing decor with the help of her colorful collection of creatures. 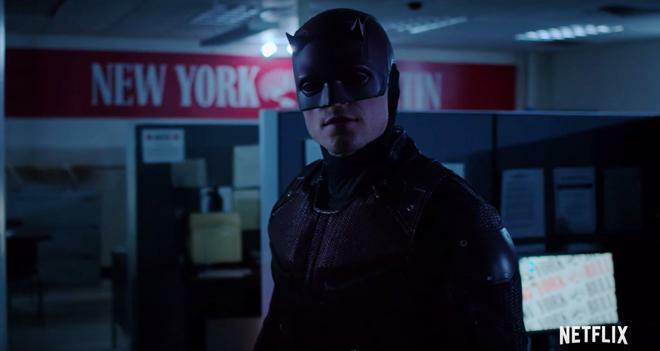 Marvel's Daredevil: Season 3 (Netflix, October 19) - Missing for months, Matt Murdock (Charlie Cox) reemerges a broken man, putting into question his future as both vigilante Daredevil and lawyer Matthew Murdock. But when his archenemy Wilson Fisk (Vincent D’Onofrio) is released from prison, Matt must choose between hiding from the world, or embracing his destiny as a hero. Chilling Adventures of Sabrina (Netflix, October 26) - Half witch. Half mortal. On her 16th birthday, Sabrina (Kiernan Shipka) has to make a choice between the witch world of her family and the human world of her friends. With her aunties (Miranda Otto, Lucy Davis), her cat Salem, and her boyfriend Harvey Kinkle (Ross Lynch), Sabrina will face horrors and new adventures in the mysterious town of Greendale. From the executive producers of Riverdale comes a haunting new tale. Been So Long (Netflix, October 26) - Romance, rage and revenge. Been So Long is a neon soaked, modern day romance set on the streets of London’s musical hot-bed of Camden. We follow Simone (Michaela Coel), a dedicated single mother who, on a rare night on the town is charmed by a handsome yet troubled stranger, Raymond (Arinzé Kene), igniting old and new feelings. Set against the backdrop of an ever-changing city, Been So Long is a fresh take on love, life and moving on. Puppy Star Christmas (Netflix, November 22) - From the world of PUP STAR, and the creators of AIR BUD & AIR BUDDIES, comes a new holiday treat for the whole family, PUPPY STAR CHRISTMAS! The family just got bigger! And the new pups: Cindy, Rosie, Charlie, and Brody will have to learn the true meaning of Christmas. When Pup Star’s mean team, scheme to ruin Christmas, the pups venture to the North Pole to save Santa & the holiday spirit. Their adventure is filled with great pup-tastic songs to spread holiday cheer all-year-round. Also available on Digital HD on November 20. Light As A Feather (Hulu, October 12) - An innocent game of “Light as a Feather, Stiff as a Board” goes wrong when the five teen girls who played start dying off in the exact way that was predicted, forcing the survivors to figure out why they’re being targeted – and whether the evil force hunting them down is one of their own. Marvel's Runaways: Season 2 (Hulu, December 21) - Every teenager thinks their parents are evil. What if you found out they actually were? Marvel’s Runaways is the story of six diverse teenagers who can barely stand each other but who must unite against a common foe – their parents. - A current Netflix subscription starts at $11 per month for HD streaming and $14 per month for Ultra HD streaming. - A current Hulu subscription starts at $8 per month with commercials. In addition, ad-free playback is available for $12 per month.